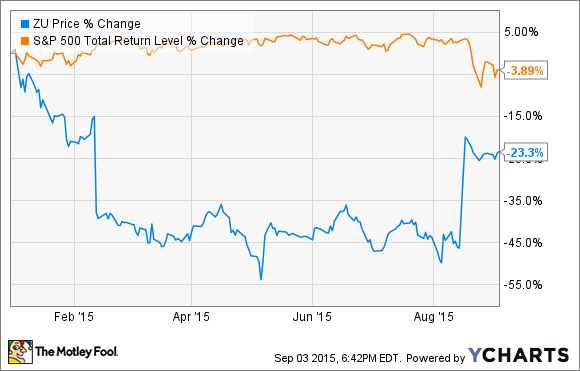 Is Zulily's recent rise meaningful? Or just another movement? So what: The massive drops in February and May came as zulily fell short of analysts' respective expectations with its fiscal fourth-quarter 2014 and first-quarter 2015 reports. With the latter, however, zulily hinted at strength to come given the launch of its redesigned website, which featured a more responsive design aimed at enhancing a shopper's experience across all platforms. What's more, zulily CEO Darrel Cavens noted that, while customers acquired from product- and event-specific marketing drove higher initial purchases, they also resulted in lower lifetime values and higher customer churn. As a result, zulily decided to prudently slow marketing, and retool its processes with long-term returns on investment in mind. That long-term focus began to yield fruit in zulily's most-recent quarter, where it handily beat Wall Street's expectations on both revenue (up 4% year over year, to $297.6 million), and adjusted net income (down by a third, to $0.06 per share). More specifically, according to Cavens, that outperformance could be chalked up to a combination of cost management, progress in marketing strategy, and the result of prior investments aimed at improving zulily's supply chain. On Aug. 17, however, the biggest jump came after Liberty Interactive announced a definitive agreement to acquire Zulily for roughly $2.4 billion. Now what: Under the deal -- which is expected to close in the fourth quarter -- Zulily will join QVC Group "to create a discovery-driven and experiential digital commerce powerhouse with appeal that spans generations of women." The two brands enjoy largely complementary customer bases, and will represent a combined business with annual revenue of over $10 billion. In the end, it was relatively unsurprising investors were willing to give the promising retailer a second chance after its solid fiscal second-quarter results. But I still would have preferred continuing to watch Zulily's progress from the sidelines had the QVC deal not been announced. With shares of Zulily currently trading at only a slight discount to its acquisition price, I think investors would do well to put last month's quick profits to work elsewhere.